Artist's impression of the ROSAT satellite as it orbits the Earth. ROSAT was used to conduct research into X-ray sources. A sample representation based on three consecutive orbits of ROSAT around the Earth. Each of these orbits has a duration of about 90 minutes. The path of one orbit to another gradually changes above Earth's surface. This image shows ROSAT on 12 April 2011. 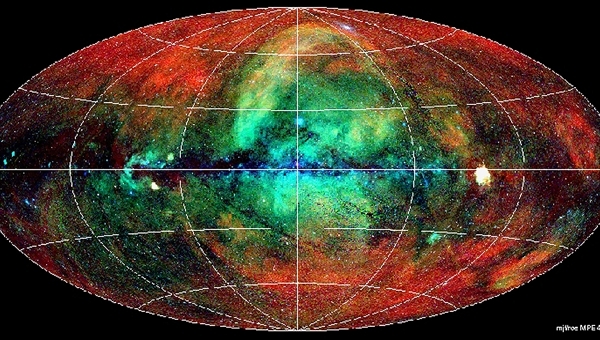 This image, obtained with ROSAT during its all-sky survey in 1990 and 1991, shows the entire sky in X-rays. In this image, our Milky Way lies at the level of the equator, where supernovae remnants (for example in the Vela constellation on the right half of the image) and X-ray binaries can be seen. The various colours indicate the different energy strengths of the X-ray radiation. 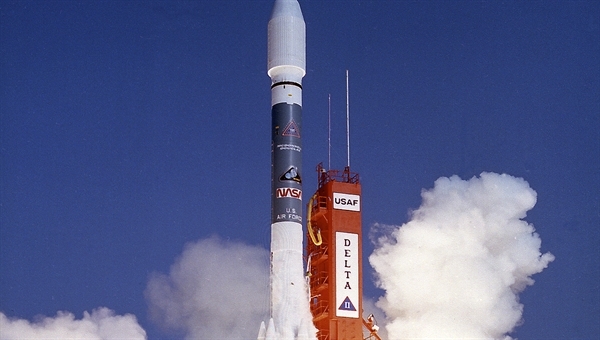 This X-ray satellite was launched from Cape Canaveral in Florida on 1 June 1990 on board a Delta II rocket property of NASA. Originally, the plan was to put Rosat in Earth orbit on board a US Space Shuttle. Following the explosion of Challenger in 1986 (when ROSAT was under construction), it was decided to launch the X-ray satellite into orbit on board a rocket. 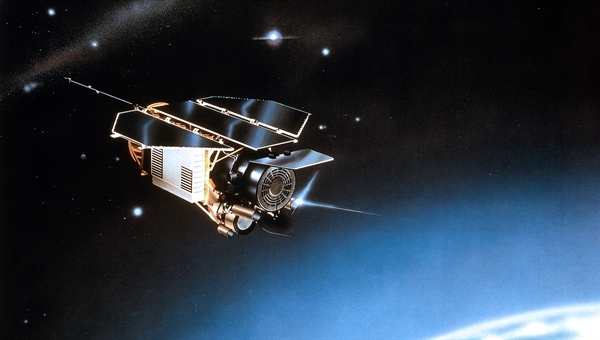 Since its launch on 1 June 1990, friction due to Earth's upper atmosphere has been causing the X-ray satellite ROSAT to lose altitude continuously. When the spacecraft re-enters the atmosphere, which is expected to occur in October 2011, the satellite will disintegrate and most of the fragments will burn up in the extreme heat caused by atmospheric friction. This FAQ provides answers to the most common questions about the ROSAT mission and its re-entry. Why was the ROSAT mission discontinued? The ROSAT mission was designed to last for 18 months. However, it proved to be such a great success in terms of the scientific benefits it provided that the mission was extended for as long as was technically feasible. For a long time, it proved possible to offset the effects of age-related deterioration in ROSAT’s onboard systems. For example, in 1993, following the failure of gyros that control the orientation of the satellite in space, a new kind of control system was implemented. This system used the direction of the Sun and the Earth's magnetic field to determine the spacecraft orientation. Then, in 1994, the gas supply required for the measurements conducted by the Position Sensitive Proportional Counter (PSPC) ran out, after which observations were performed using only the High Resolution Imager (HRI), an instrument that required no consumables. Finally, in 1998, the mission came to an end. The failure of a star tracker caused the remaining HRI detector to point directly at the Sun, causing irreversible damage. Since no further scientific use could be made of the satellite, it was shut down on 12 February 1999, more than eight and a half years after its launch. What scientific tasks were performed by ROSAT? Extremely hot and energetic processes taking place throughout the Universe produce X-rays. These processes often involve extreme states of matter such as black holes or neutron stars. To understand these processes, the origin, spectral composition and energy distribution of the X-ray radiation has to be determined. Since Earth's atmosphere absorbs X-ray radiation, preventing it from being observed from the ground, the ROSAT satellite, which was equipped with an X-ray telescope, was needed to do this. It discovered that almost all astronomical objects emit X-ray radiation, including some objects where this had not been expected. The observed objects included the Moon, comets, stars, X-ray binary stars, neutron stars, supernovae and supernova remnants, the interstellar medium, galaxies, active galactic nuclei, black holes, nebulae and the cosmic X-ray background. The results have been documented in many publications. Observations at other wavelengths (visible light, radio, infrared and gamma radiation) supplement the information relating to these astronomical objects. What were the most important scientific results of the ROSAT mission? Over the course of its eight-year service life, ROSAT greatly exceeded the original expectations of the scientific community, performing a large number of excellent scientific observations. It is only possible to very briefly list here the objects observed and the discoveries made: the first ever full-sky survey with an imaging X-ray telescope, the resolution of the cosmic X-ray background into individual sources, observation and analysis of the hot gas that fills the gravitational potential of galactic clusters, the observation of supernova remnants, the discovering of 'super-soft sources' in the Large Magellanic Cloud and, finally, the surprising discovery that comets also emit X-ray radiation. The ROSAT catalogue of pointed Position Sensitive Proportional Counter (PSPC) observations, revised in 2001, includes the positions and count rates of more than 100,000 X-ray sources. How did the ROSAT X-ray telescope work? The optics for an X-ray telescope are completely different to those familiar from visible light or infrared telescopes. A normal lens or a mirror would simply absorb X-ray radiation. X-ray radiation is only reflected if its strikes a highly polished surface at a very shallow angle. Based on these findings, Hans Wolter, a physicist who lived and worked in Kiel, Germany, developed a tubular X-ray optical system in 1951, in which X-ray radiation is focussed by grazing-incidence reflection, a technique now known now as the ‘Wolter mirror’. Since only the radiation from a narrow, annular region contributes towards the effective area, ROSAT used four different sizes of Wolter mirror, nested concentrically inside one another. At the focal point, located 2.4 metres behind the mirrors, three detectors were arranged on a carousel, allowing them to be moved into the incoming beam path one at a time. The three detectors were two identical Position Sensitive Proportional Counters (PSPC) and one channel plate detector, the High Resolution Imager (HRI). The two types of detector complemented one another in the tasks they performed. The PSPC, developed at the Max-Planck Institute for Extraterrestrial Physics in Garching, Germany, had a large field of view, an energy resolution that made it possible to distinguish four energy bands, or ‘colours’, and high sensitivity but a lower spatial resolution than the HRI. The Smithsonian Astrophysical Observatory in Cambridge, Massachusetts, developed the HRI, which was supplied by NASA. The HRI had a higher spatial resolution, but a smaller field of view than the PSPC, and no energy resolution capability. The PSPC therefore took X-ray ‘colour photographs’, whereas the HRI delivered sharper 'monochrome' imagery. What specific benefits do the scientific results that were obtained with ROSAT have? The scientific objective of ROSAT was in the domain of basic research, that is, it was never intended to deliver immediate practical benefits. Instead, its aim was to improve our understanding of the origin, structure and evolution of the Universe. In the long term, basic research can also have significant economic impact. The economic strength of Germany is based to an extent on developments from quantum physics (for example, the laser), and the theory of gravitation (for example, navigation systems), neither of which were foreseen when these two disciplines emerged in the early part of the 20th century. In addition, the money for space missions of this kind is spent here on Earth. This creates work for highly skilled individuals, it serves to train new scientific talent and it also encourages the development of new technologies and methods, because projects of this kind always work at the limit of what is technologically feasible during their implementation. Will the re-entry of ROSAT be controlled in any way? ROSAT has no propulsion system on board that could be used to alter its orbit or re-entry trajectory; this means that the re-entry of ROSAT cannot be controlled. Also, since its mission ended back in 1999, ROSAT is no longer able to communicate with DLR's control centre in Oberpfaffenhofen. After more than eight years of operation, many components on the satellite had been operated well beyond their expected service lives. Alongside the loss of the X-ray sensors and the malfunctioning of the gyros mentioned in earlier answers, many other components such as the batteries that provided the satellite with power had become so old that they were either working only to a limited extent, or had ceased to function altogether. It is therefore no longer possible to establish contact with the spacecraft. Will ROSAT burn up as it re-enters Earth’s atmosphere? When spacecraft and space debris leave their orbits and enter Earth’s atmosphere, they are travelling at speeds in excess of 27,500 kilometres per hour. In less than 10 minutes, they are slowed down to subsonic speeds by the friction of re-entry. The air resistance experienced during re-entry generates a massive amount of heat. Without special equipment, such as the heat shields fitted to the American space shuttle, re-entering objects burn up – to a very large extent or even completely. Heat and aerodynamic stresses cause satellites to break apart during this process. DLR has analysed the re-entry and destruction of ROSAT. Based on the latest studies, it is thought possible that up to 30 individual debris items with a total mass of up to 1.6 tons might reach the surface of the Earth. The X-ray optical system, with its mirrors and a mechanical support structure made of carbon-fibre reinforced composite – or at least a part of it – could be the heaviest single component to reach the ground. In the event of fragments reaching the surface of Earth, they could be travelling at speeds of up to 450 kilometres per hour. Where exactly will ROSAT return to Earth? It is not possible to predict the precise time of re-entry or the exact location. Experience with other satellites shows that, six months before re-entry, the timing of the event can only be predicted to within a 10-week period. The closer the time of re-entry approaches, the more accurately the timing can be predicted. However, even just one week in advance, the timing of re-entry can only be predicted to within a 3-day window. Given that the satellite orbits Earth once every 90 minutes, it could complete more than 40 full orbits of Earth during this three-day period. Even just one day before the spacecraft leaves orbit, the timing can only be predicted to within ±5 hours, or 6.5 orbits of Earth. Since the Earth rotates below the orbit of the satellite, the area on the Earth’s surface (referred to as the 'ground track' of the satellite) that might be affected by falling debris following re-entry changes from one orbit to the next. From this information, it is clear that no statement can be made about the precise location of re-entry or any potential ground impact. 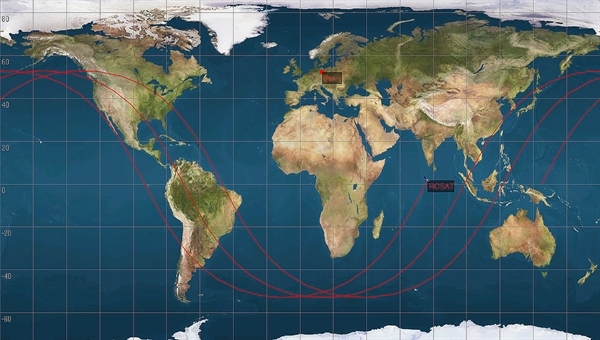 Just a few hours before the predicted re-entry time, it may be possible to specify the ground track of the orbit during which re-entry is probably going to occur. If fragments do reach the surface of the Earth, they will spread out and come down along this ground track across a swathe up to 80 kilometres wide. At this time, it will also become clear precisely which parts of the Earth’s surface are not going to be affected by re-entry debris. For example, if during this period ROSAT is not going to be overflying Central Europe, then it follows that re-entry is not going to affect that region. Might Germany be affected by re-entry? Yes, there is a chance that Germany might be affected. The orbit of the satellite means that ROSAT overflies regions up to a maximum northerly latitude of 53 degrees. Allowing for some degree of scattering of possible fragments, this means that regions in Germany might be affected up to about 53.4 degrees, that is, up to 40 kilometres above the 53rd parallel. Specifically, this means that the northern part of Lower Saxony, Hamburg, Schleswig-Holstein and the vast majority of Mecklenburg-Vorpommern cannot be affected. It will only be possible a few days prior to re-entry to determine whether or not the calculated ground track for the re-entry of ROSAT might actually cross Germany. However, even in this unlikely event, the probability of re-entry actually taking place above Germany is very low. How likely is it that people might be injured by the re-entry of this satellite? The likelihood of a person getting injured as a result of the re-entry is extremely low. Taking account of the projected total surface area over which damage might be caused by the fragments that – theoretically – might survive re-entry, the orbital path of the satellite and the distribution of human populations on Earth, it is possible to calculate that the probability of someone somewhere on Earth getting injured is about 1 in 2,000; that is, one person is predicted to be injured for every 2000 de-orbit events of this kind. The probability of someone in Germany being harmed is much lower: about one injury for every 700,000 de-orbit events. Will it be possible to observe the re-entry from Earth? It is relatively unlikely that anyone will be able to observe the actual re-entry of ROSAT. Most objects from space that enter Earth's atmosphere come down over the sea or over uninhabited regions where there are no human observers and no radar stations. In all cases though, active and inactive satellites as well as other large items of space debris are monitored by an American radar space monitoring system as they orbit around Earth. The monitoring data is available to German scientists and will be used during the months leading up to the re-entry of ROSAT to track the decay of its orbit and its slow descent towards Earth’s atmosphere. As the time of re-entry draws closer, the braking effect of the atmosphere will become progressively more intense, and the orbital altitude of ROSAT will start to decay more rapidly. To calculate its orbit more precisely at this time, more radar stations will become involved, including the large Tracking And Imaging Radar (TIRA) facility at Wachtberg, near Bonn, Germany, belonging to the Fraunhofer Institute for High-Frequency Physics and Radar Techniques. In addition, re-entry will be tracked through an international cooperative effort, working together to define the re-entry time and potential debris track as precisely as possible. This involves the international partners who make up the Inter-Agency Space Debris Coordination Committee (IADC) contributing their own measurements to supplement the TIRA data. With the help of these measurements, international specialists, each with their own computer programs, will be lending their best efforts to the Germany experts working on behalf of DLR and the European Space Agency (ESA) to calculate the expected re-entry time. All of this information will be collected and evaluated in the European Satellite Operations Centre (ESOC) in Darmstadt, then forwarded to DLR. Why will ROSAT not be intercepted and brought back to Earth under controlled conditions? The technologies for capturing satellites and de-orbiting them under controlled conditions are still at the development stage. It will be a several years, at the earliest, before the first demonstration missions can be launched with the aim of proving the technological feasibility of this kind of operation. However, even once these technologies become available, only a few objects will be selected for controlled re-entry, not the majority of satellites and upper stages of launchers. Are other satellite re-entries to be expected? Satellite re-entries are cannot be avoided; space debris re-enters Earth's atmosphere on an almost weekly basis. Over the last few years, the total mass of this debris has amounted to about 60 to 80 tons per year. This total includes small items of debris as well as spent upper stages of launchers and satellites of every shape and size. Items of debris have been found on the ground only in very rare cases. The total mass of natural objects reaching the Earth's surface (meteorites) far exceeds that of debris from man-made objects or fragments resulting from activities in space. Are preparations being made in Germany for this re-entry? Despite the fact that the probability of ROSAT coming down over an inhabited area – or even over Germany – is extremely low, ROSAT's orbit has been under continuous observation since the end of its mission. The responsible public-sector bodies at various levels are kept continuously informed of developments. With the participation of scientific experts, the Inter-ministerial Coordination Group of the German Federal Government and state governments determined by consensus in November 2010 that even in the most unlikely expected event, debris impact in Germany, the available emergency personnel, contingency plans and other means at Germany’s disposal will be able to cope.